You will find all kinds of comments and thoughts and how to build railings of all kinds. The railing serves two important functions: safety and visual beauty. That applies equally whether it is made of wood, aluminum, glass or composite railings to name a few as well. Have a question about deck railings? 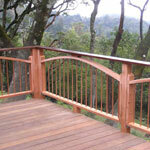 If you have a question about deck railings, you've come to the right place! If you're looking for other visitors submissions, click here or scroll past the submission form. Best way to secure railing at 10' spans? Deck Railing Height With Bench? 2x4 Deck rails connected to 4x4 posts? I have a 14ft span of stairs between rails for an unobstructed view to the beach. Should I place rails between and how far apart for code? Replace railing not to code? Is there an easy way to install stair railings at the right angle?